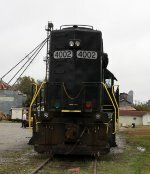 Description: Carolina Southern Geep 4002 sits just short of the crash board guarding the CSXT diamonds at Mullins SC. Description: Carolina Southern GP38 4002 is stuffed on a siding off Country Club Rd in North Conway over the Thanksgiving weekend. The shortline's ex-ACL track to Chadbourn runs into the distance.